Would you be concerned by mold, bacteria, mosquitos, unexpected costs and more maintenance than you’d bargained for? Most people would… Yet with the demonstrations the manufacturers of “gutter guards” show, you would assume every gutter cover system gets the job done. This all sounds GREAT, but is it really true? 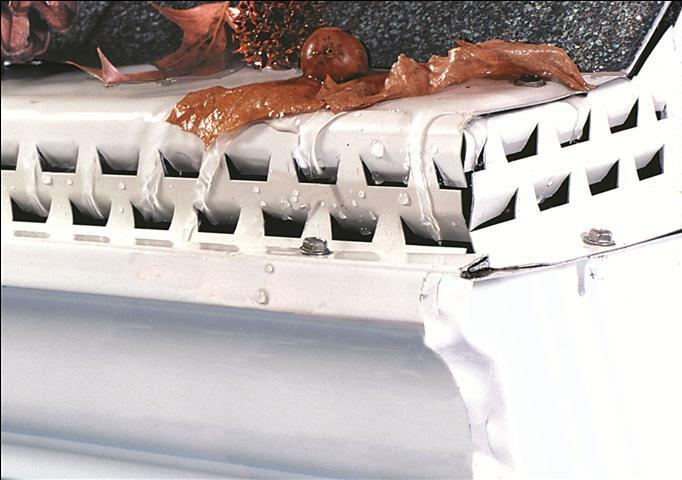 Most other gutter covers, primarily the helmet type, contain only one long fin, that can let in large size leaf debris over time. Gutter Helmet is prone to unsightly staining and grime build-up. This causes it to lose liquid adhesion which results in water completely missing the gutter, defeating the purpose. creating an evenutal blockage, again requiring you to hire someone or go up there yourself and clear off the leaves. Not exactly maintenance free. Screens are flimsy and often get bent out of shape by heavy snow and ice. Small seeds can sometimes get thru and allow them to sprout within the system. Waterloov® has a face with two rows of discriminating louvers that limit the size of debris and collect all the water without overshooting. The small amount of debris that manages to get through the louvers is washed out because the design of the louvers causes a swirling action at the bottom of the gutter as shown. Stagnant water isn’t a healthy thing to have around. It’s a breeding ground for mosquitos, bacteria and mold. With the louvers creating a swirling action and downforce, the result is a system that prevents seepage, rust, rot and mold. Stop, don’t get hurt climbing up on that latter! Made of top-quality aluminum, we believe the Waterloov system is solid, will never rust and will not deteriorate. Waterloov is one of the only systems on the market that’s been tested for over 20 years and proven to not get clogged! to help ease your pain and squash your problems, with The Waterloov Gutter Cover System.